... for Americans, Aussies and South Africans and a few hardy Brits BBQ-ing with an offset smoker is now popular here all year round. 15 years ago I was one of the very few supplying a small but very keen group of low an' slow cooks. There's quite a bit of choice now but I hope you'll give my woods a go. ... is good for new & experienced smokers as it offers a variety at a discount from per kg prices. Of the three woods Oak is the cheapest followed by Cherry and then Apple. The Oak subsidises the more expensive fruit woods so if you had just Apple and Cherry it would be more expensive. There is an option to spec up these boxes with a bag of Hickory or Mesquite or Pecan on top for same delivery price or my other woods listed below. I've kept the same price for 2018 as the last two years. ... more exy than my Hampshire Woods are Hickory Olive Mesquite and Pecan - more info below. 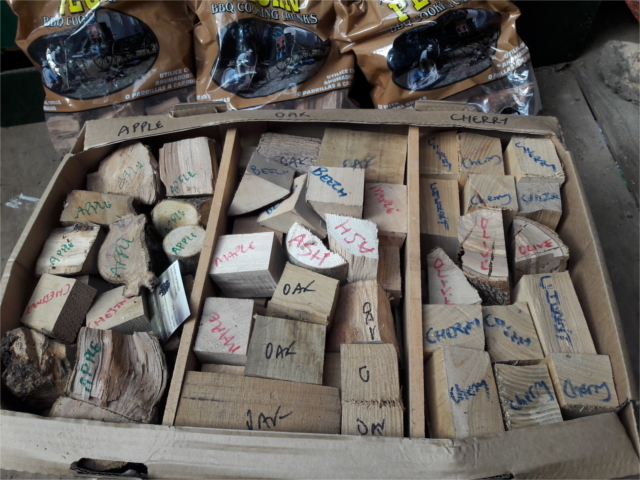 In addition the big 3 English woods above I have Ash, Beech, Birch, Olive, Maple, Walnut and Sweet Chestnut with occasional Alder and Plum - prices. ... rather than the mixed box you can have whatever mix you like. These orders I tend to put in foodbags in 2 kg quantities. Six 2 kg bags fill a box nicely and should last large number of cooks. If you have a urge for a English wood not listed above like Elm which hasn't proved popular I can try and get it for you. ... wood from the other side of the pond . 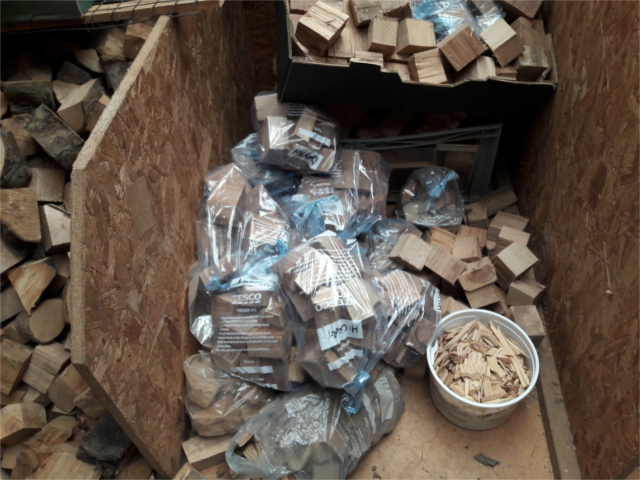 I've been importing it for a few years now trying to improve the quality of the wood without making it too exy but even so with freight costs and import duty it's always going to cost more than local woods. The latest batch comes in spindles that I recut and chop to a more popular size & sell it in supermarket food bags, see below. Current price is £9 for a 2kg bag. 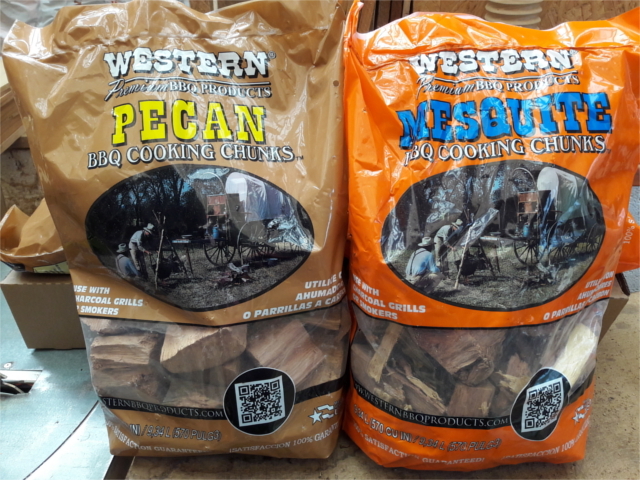 ... and after a couple of years trying to get the right stuff at a sensible price I can finally offer Mesquite and Pecan. The company in the USA do a larger range but let's see how these go down before widening the choice! ... a branded bag weighing about 3 kgs. All the American stuff comes with smaller bits as well as the chunks but it looks pretty good to my uneducated eye. ... as I just sell the drugs, so to speak! There are so many really knowledgeable people on the British BBQ Society Forums that I strongly advise you to have a look at it - you can index search the subject you want from types of meat to where the next competition. Email me Paul if you want any more information or to discuss your order.